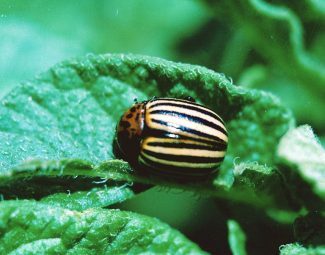 Colorado Potato Beetle crop hosts include potato, tomato, eggplant, pepper, cabbage, petunia and tobacco. 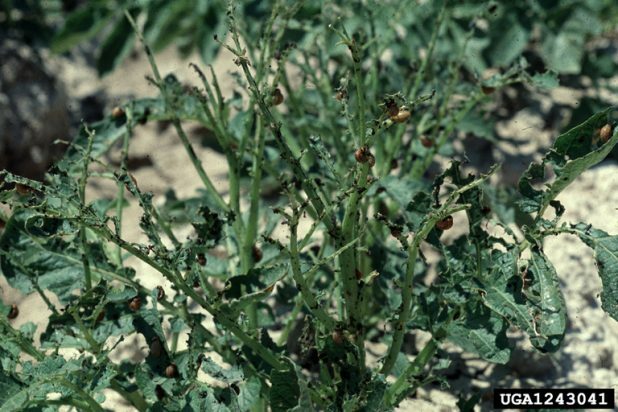 Weed hosts include buffalo bur, jimson, henbane, horse-nettle, belladonna, thistle, nightshade, mullein and ground cherry. 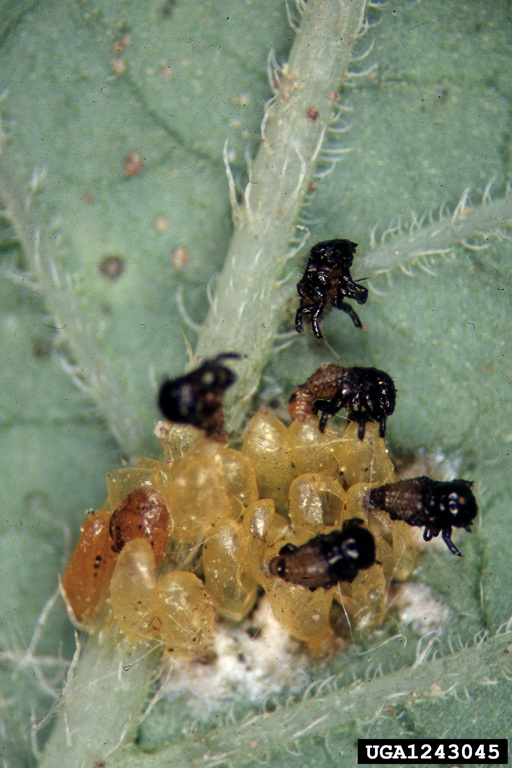 Larva and adults feed on leaves of host plant. Feeding within 2 weeks of peak bloom can have significant effect on yield. 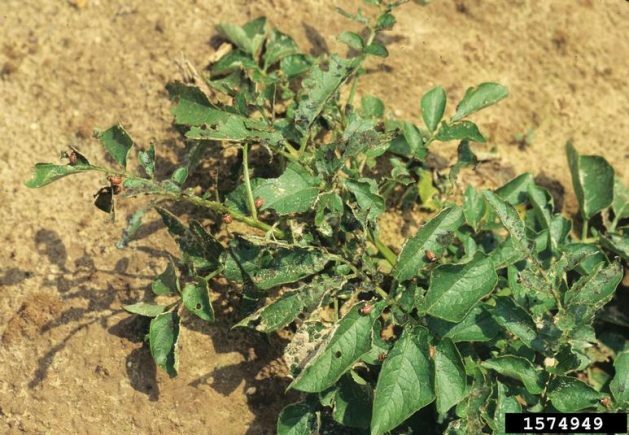 Damage suffered during early and late development of host plants has limited effect on yield. 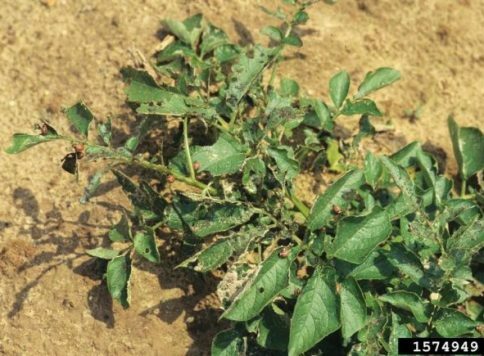 Has shown ability to rapidly develop resistance to commonly used conventional pesticides, especially when the same class of insecticide is used in succession. 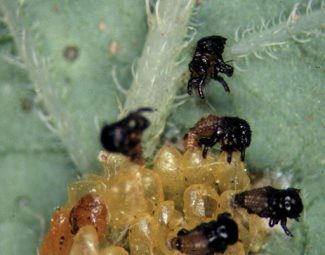 Use aggregation pheromone to attract other feeding individuals when suitable host material is located. 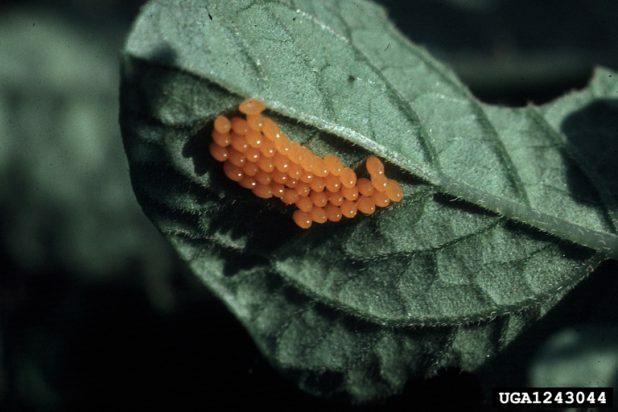 Eggs… (4-15 days) Usually found underneath leaves in clusters of approx. 30. Yellow to orange in color. Larva…(6-10 days.) Red body with black dots on both sides, and black heads. Round in shape with a rippled body. 6 legs. 1.5-8 mm. long. Often found feeding together in groups. Pre-pupa… Non-feeding larva. 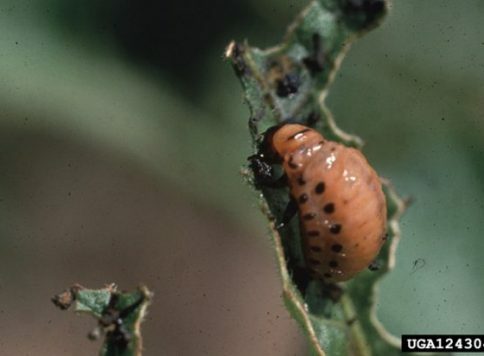 Inactive on foliage and lighter colored than larvae. Drops to ground and burrows to pupate. Adult… 3.8 in. 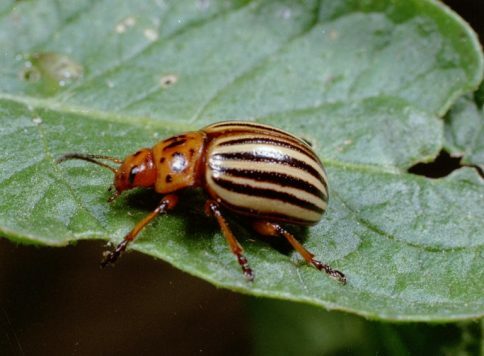 body is round and has yellow and black stripes with a yellow head. Females can lay as many as 800 eggs. Over-winters as adult 12-18 in. underground or in trash piles, brush, ground litter, and other insulating environments. 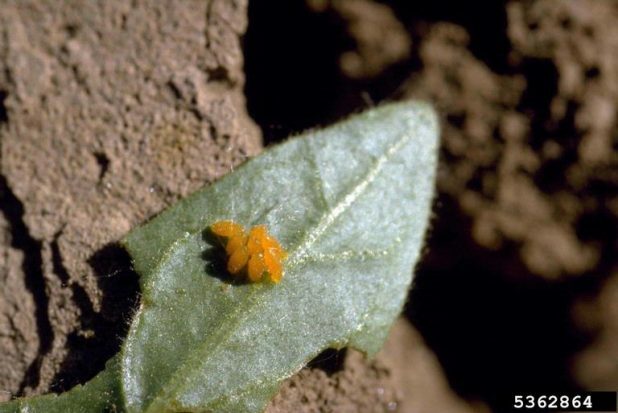 Becomes active in spring and starts laying eggs as soon as suitable host plants are found. 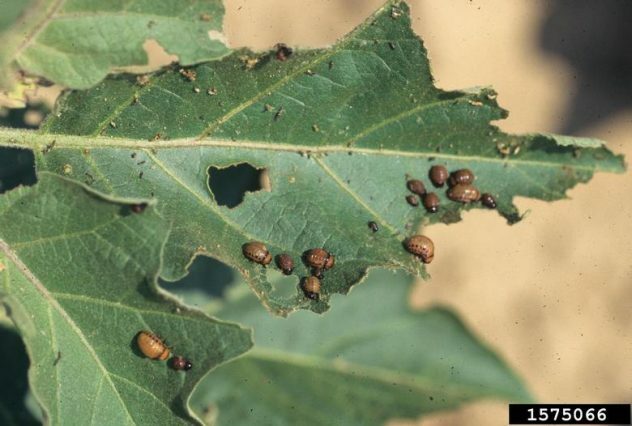 Check for egg masses underneath leaves. 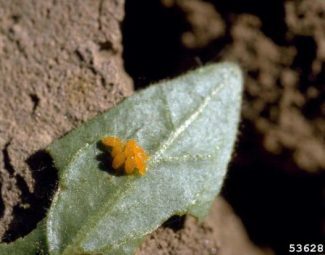 Foliar applications for pest control should begin when approximately 15-30% of egg masses have hatched. 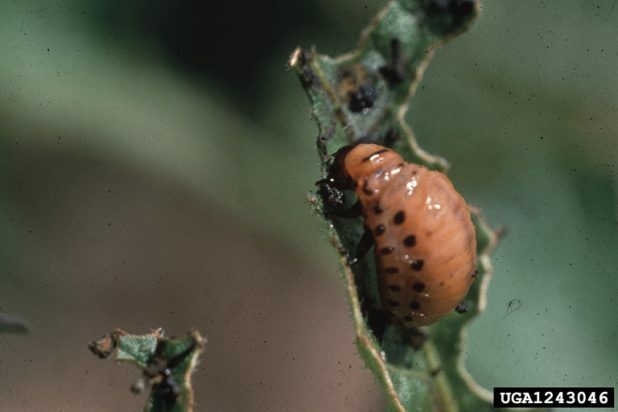 Most control methods are more effective on smaller larvae, so timing is critical. Control is most crucial within 2 weeks of bloom. 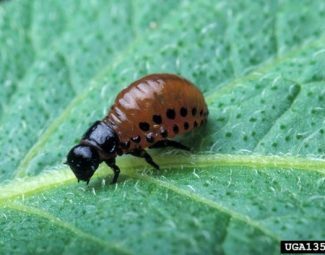 Ladybug beetles (Coleomegilla maculata) and the parasitic wasp Edovum puttleriare are natural predators and are commercially available. Predatory nematodes such as Heterorhabditis have been shown to have efficacy and are commercially available. Flaming, using a propane flamer, has been demonstrated to reduce CPB adult populations by 70-80% and egg hatch by 35%. 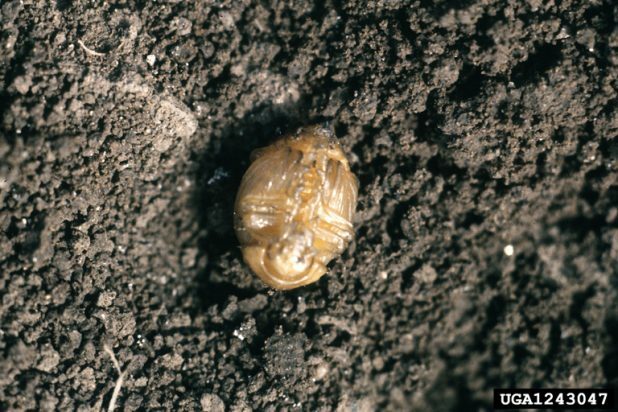 Manual removal of larva and adults by hand or vacuum. 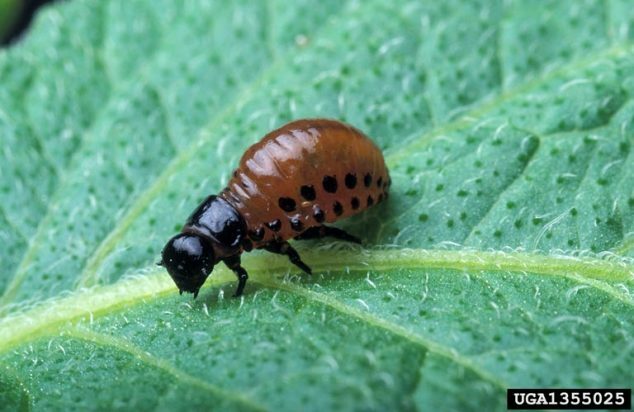 Use fabric row covers to protect plants from infestation. Trenches dug around the crop perimeter at angles in excess of 46 degrees and lined with plastic have been shown to trap migrating adults emerging from winter diapause. Since adults are capable of flight, not all migrants may be caught. 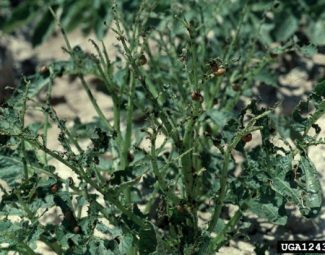 Delayed planting can result in increase of mortality in emerging over-wintering populations if alternate host plants are not available. Early planting of small acreage of preferred host crop before planting of market crops can serve as trap crop. 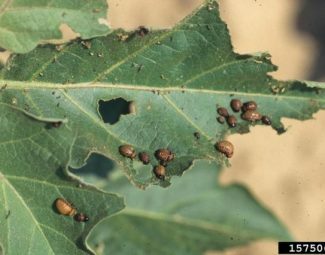 Proper population monitoring and control is necessary to prevent trap crop from becoming source of infestation. Mulching in between planted rows may provide a habitat for natural enemies. 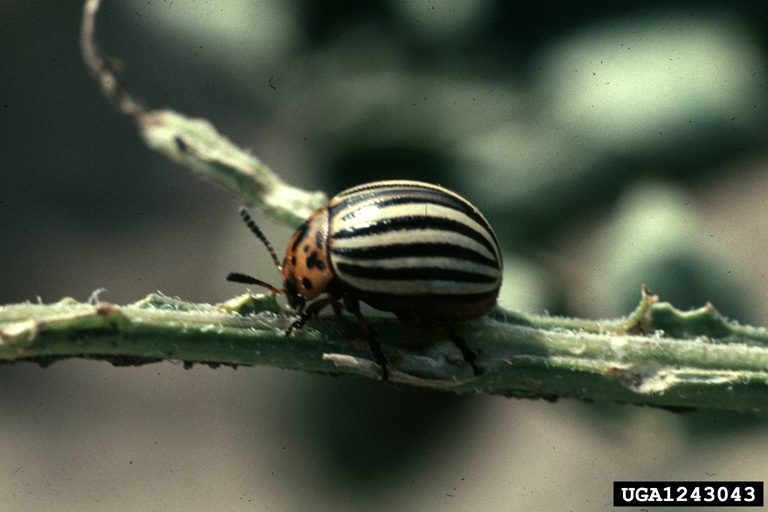 Plant varieties that are more tolerant to CPB infestation such as Russet Burbank. Plant early maturing varieties such as Caribe, Norland, Pungo, Redsen, Sunrise, Superior, and Yukon Gold that minimize the time that is needed to complete tuber production. This limits the number of CPB generations that can be produced during crop season. Regular rotation to non-host crops. 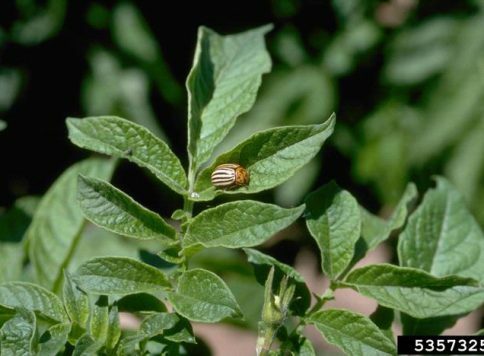 Desiccate foliage as soon as tubers are mature. Moyer, Dale D. Development of a Propane Flamer for Colorado Potato Beetle Control. Cornell Cooperative Extension. 1991. Boiteau, G., et al. 1994. 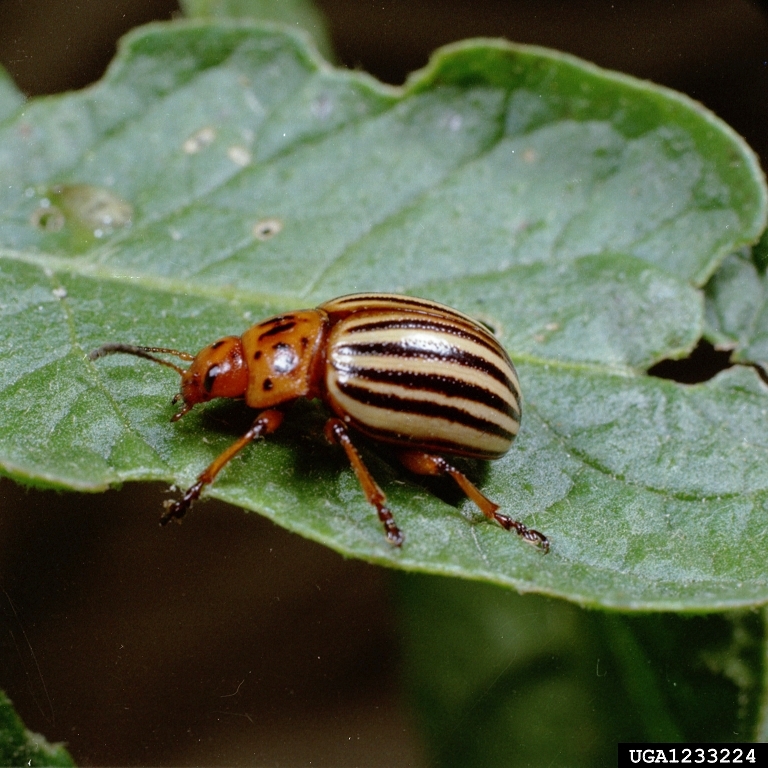 Development and evaluation of a plastic trench barrier for protection of potato from walking adult Colorado potato beetles (Coleoptera: Chrysomelidae). Journal of Economic Entomology. October. p. 1325-1331. Brust, G.E. 1994. 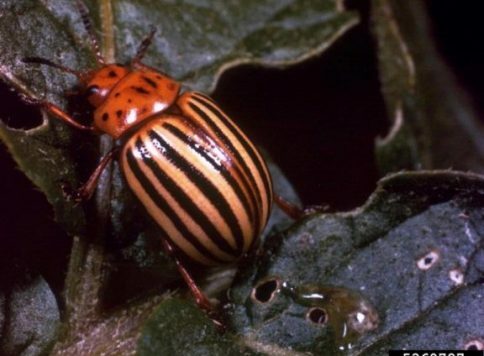 Natural enemies in straw-mulch reduce Colorado potato beetle populations and damage in potato. 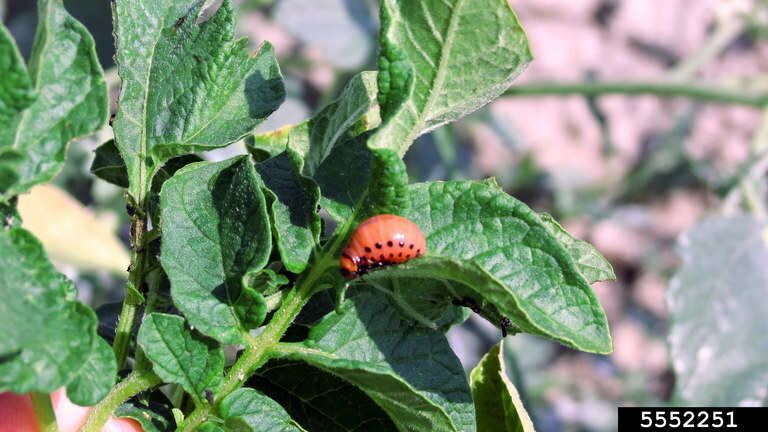 Biological Control. Vol. 4, No. 2. p. 163–169. Berry, R.E., J. Liu, and G. Reed. 1998. 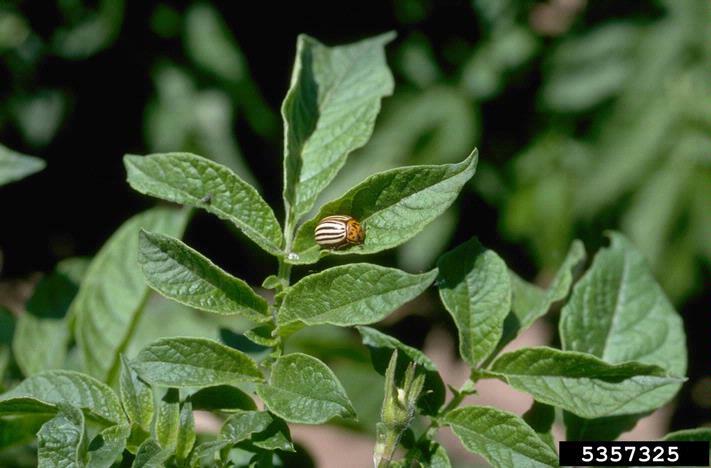 Comparison of endemic and exotic entomopathogenic nematode species for control of Colorado potato beetle (Cleoptera: Chrysomelidae). Journal of Economic Entomology. Vol. 90, No. 6. p. 1528–1533. 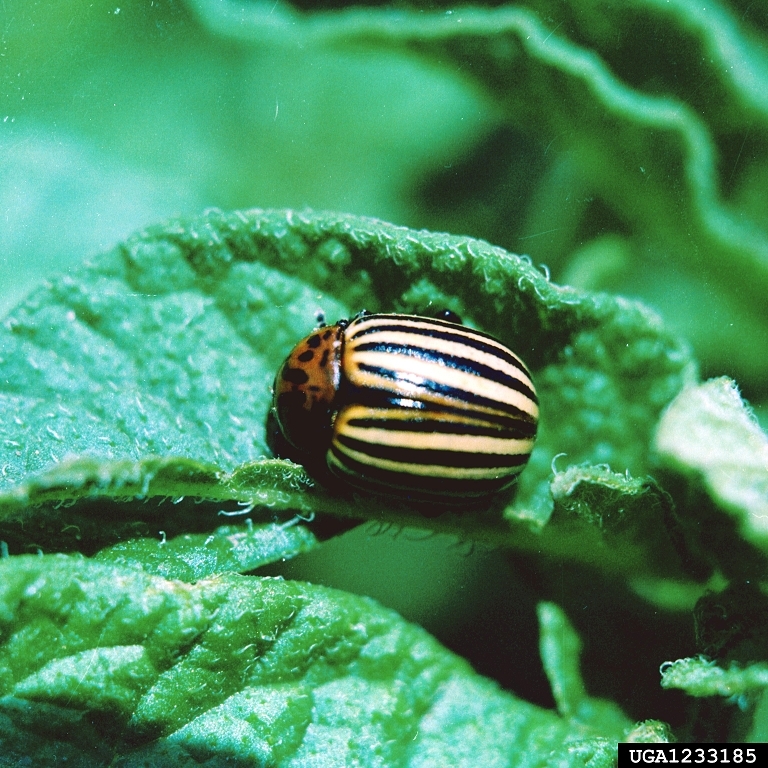 Dickens, J.C., et al., “Breaking a Paradigm: Male-Produced Aggregation Pheromone for the Colorado Potato Beetle”, J. of Experimental Biology, vol. 205, pp. 1925-1933, 2002.